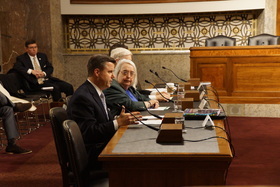 AFSA CEO Robert L. Frank testifies before the Senate Armed Services Subcommittee on Personnel Feb. 11. March 6, 2015 -- The Air Force Sergeants Association, alongside 22 other Veterans Service Organizations, submitted their final letter to the U.S. Senate Armed Services Committee March 6 with their opinions regarding the Military Compensation and Retirement Modernization Commission’s report. The letter is addressed to Chairman of the Committee on Armed Services John McCain, Chairman of the Personnel Subcommittee of the Committee on Armed Services Lindsey Graham, as well as Ranking Member of the Committee on Armed Services Jack Reed, and Ranking Member of the Personnel Subcommittee Kirsten Gillibrand. Several of the recommendations are supported by the organizations involved, however a further examination is being requested of two significant changes to the current retirement and health care benefits, as well as general nonsupport of other recommendations. Opinions are given on each of the original 15 recommendations from the MCRMC report. The official letter can be downloaded and read directly below.